Some brides like to keep it simple, from the venue to the dress to the hairstyle. 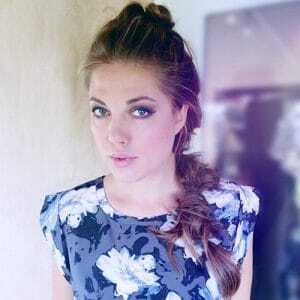 If that’s you, one of the best simple wedding hairstyles is the bun updo. Check out these pictures for 5 different ways to get the look with bridal hair accessories and veils. This gorgeous bridal hairstyle has something old and something new. The retro inspired hair and make up features some volume at the crown and a low bun. The something new is wispy face framing tendrils and an on trend bridal headband. This stunning yet simple style would work for any wedding venue from a church to city hall to the outdoors. None of these bun updos are your everyday bun hairstyle. From the front, this looks like many updos with deeply side swept bangs. 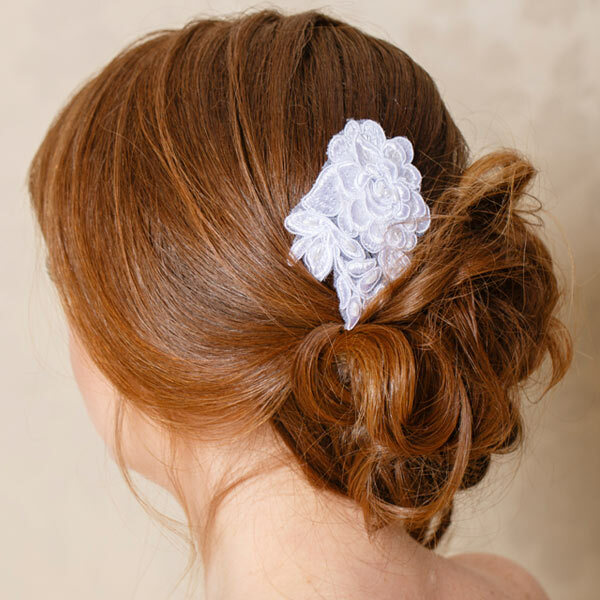 This low bun gets added detail in the form of a twist and cute bridal hair pins. The low messy bun is always a favorite updo. This lovely version is all about texture, in both the hairstyle and lace accessory. When choosing your bridal hair accessory, think about the dress and hairstyle. If you have doubts, check with your stylist. Remember, a trial run will ensure your big day goes smoothly. This ballerina-inspired bun is worn high enough to be seen from the front. 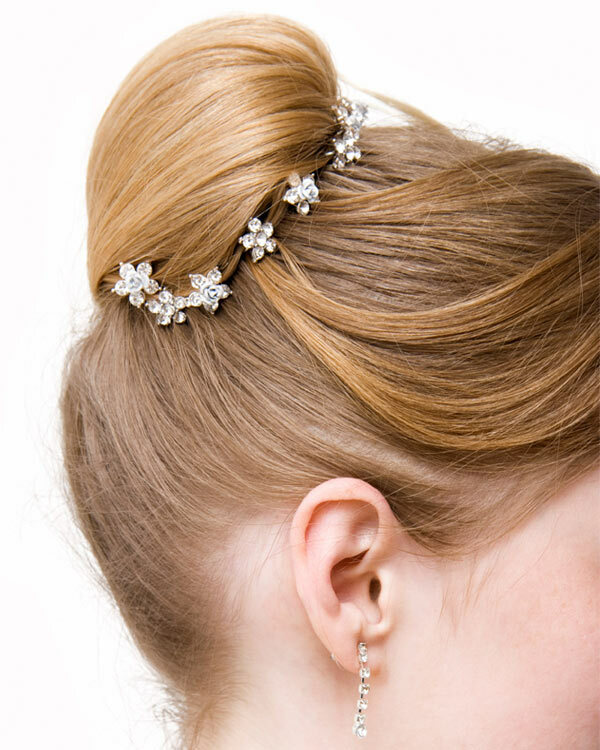 Rhinestone flower hair pins circle the updo but you could also wear one or two. And if you’re all about the veil, here’s one way to wear one with a bun. Bridal veils can be pinned above or below the updo. For this high bun, the veil is secured below. Again, consult your stylist to figure out what will work best for your particular hairstyle and veil. The bun is one of the easier wedding hairstyles out there. They are simple, elegant, and a gorgeous canvas for any wedding hair accessory. Of course, you’ll still want a professional stylist to get a gorgeous hairstyle that stays in place all day and night.